Theresa The Crystal Guardian (Support) - Creative Exchange - Mobile Legends: Bang Bang - Powered by Discuz! 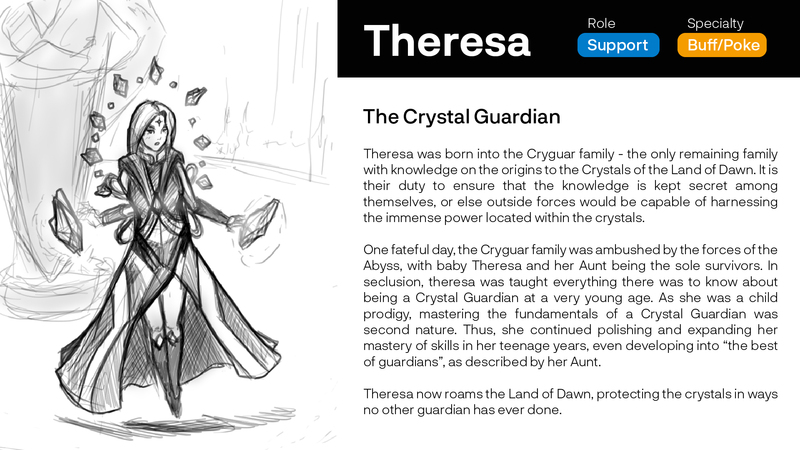 Theresa was born into the Cryguar family - the only remaining family with knowledge on the origins to the Crystals of the Land of Dawn. It is their duty to ensure that the knowledge is kept secret among themselves, or else outside forces would be capable of harnessing the immense power located within the crystals. One fateful day, the Cryguar family was ambushed by the forces of the Abyss, with baby Theresa and her Aunt being the sole survivors. In seclusion, theresa was taught everything there was to know about being a Crystal Guardian at a very young age. As she was a child prodigy, mastering the fundamentals of a Crystal Guardian was second nature. Thus, she continued polishing and expanding her mastery of skills in her teenage years, even developing into “the best of guardians”, as described by her Aunt. Theresa now roams the Land of Dawn, protecting the crystals in ways no other guardian has ever done. 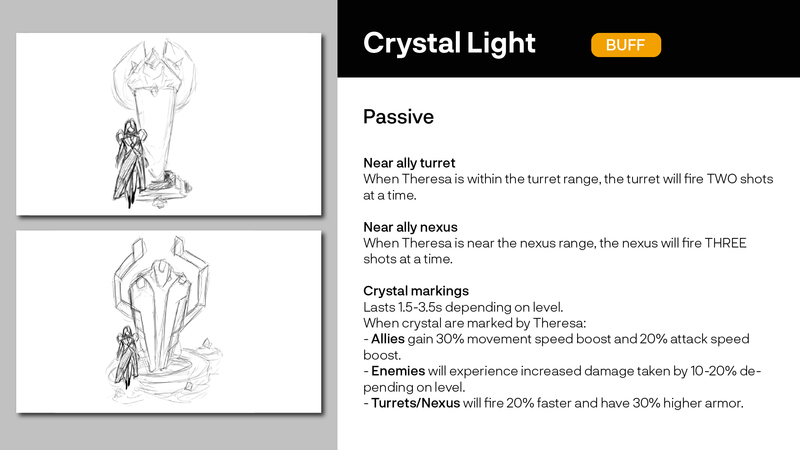 When Theresa is within the turret range, the turret will fire TWO shots at a time. When Theresa is near the nexus range, the nexus will fire THREE shots at a time. Lasts 1.5-3.5s depending on level. Allies gain 30% movement speed boost and 20% attack speed boost. Enemies will experience increased damage taken by 10-20% depending on level. Turrets/Nexus will fire 20% faster and have 30% higher armor. 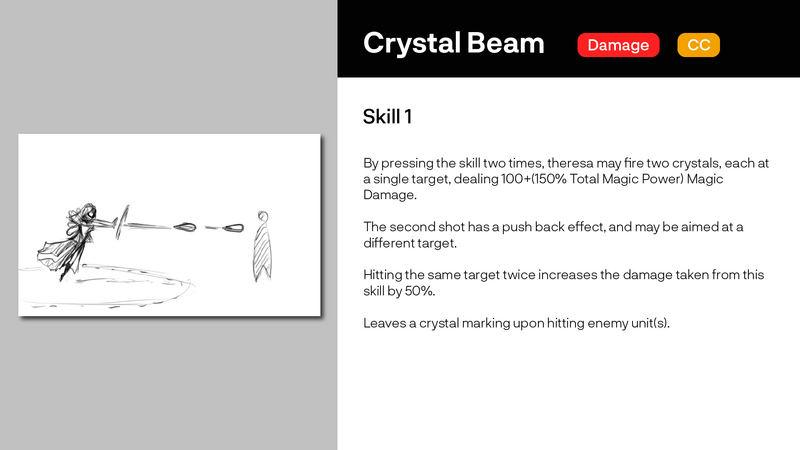 By pressing the skill two times, theresa may fire two crystals, each at a single target, dealing 100+(150% Total Magic Power) Magic Damage. The second shot has a push back effect, and may be aimed at a different target. Hitting the same target twice increases the damage taken from this skill by 50%. Leaves a crystal marking upon hitting enemy unit(s). Theresa charges and fires a barrage of crystals in a chosen radius for 1.5s-3.5s (depending on charge time). Theresa may move while using Crystal Barrage, however the radius will also move if she does so. 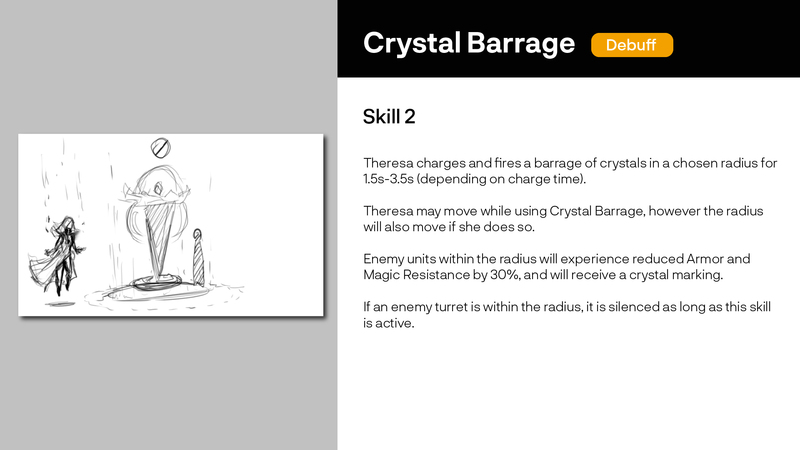 Enemy units within the radius will experience reduced Armor and Magic Resistance by 30%, and will receive a crystal marking. If an enemy turret is within the radius, it is silenced as long as this skill is active. Theresa releases the hidden power within her Crystals, immersing her surrounding area with crystal energy. In exchange for this immense power, Theresa’s HP decreases for as long as this skill is activated. One minion wave is summoned (minion size increases with level). Turrets/Nexus within the radius regain their HP by 100HP per second and receive crystal markings. Allies receive a crystal marking. Enemies receive a crystal marking. This hero is really dope, goodjob bro! I love your idea with this hero along with the drawing concept ;v would want to see it someday since we lack support heroes. Very nice concept and awesome drawing as well. Ok passive is very op and i like it for support hero. 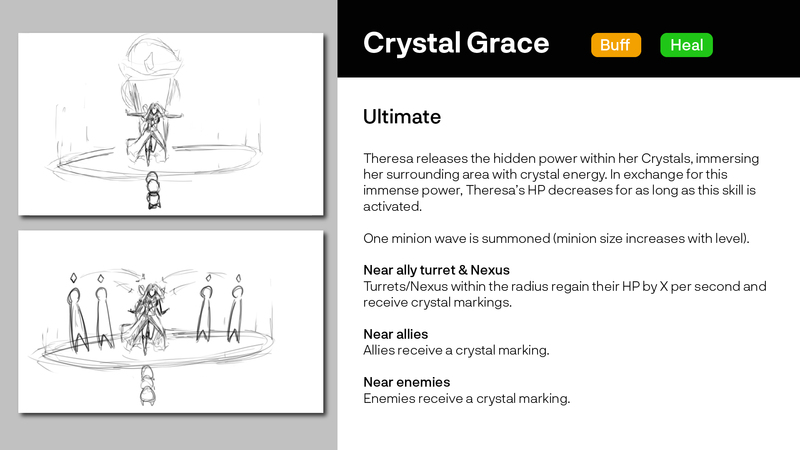 Surrounding area will be fulled with crystal energy and turret ally and enemy will get marking too.Besides minion summoning, what her ultimate can do? Just curious. Cool concept and I like the effort you put into it! Though for the skill 2, "If an enemy turret is within the radius, it is silenced as long as this skill is active", there was a battle spell like that before and I think they removed it because it is imbalance so I'm not sure with this one. Yea. the turret silence is on the battle spell survey last time. since that battle spell not make it to the list, how about we implement the power to theresa. This girl is the crystal guardin/turret guardian. her ulti can heal the turret within her area with her own HP. yea.. this idea was made from last year... but we just keep delaying to proper proposal. hope this idea can help moontoon to develop new support hero. yeah! hope theresa can bring back the objective of game to all player in MLBB. Ok thats new and unique btw. Actually, her ulti heals the turret & leaves crystal markings on turrets, allies and enemies. I like it :) Good job !